I was in Ambleside today. Unfortunately, it was for work. I’ve had three days there over the last few months and every time it has chucked it down. I suppose that it would be even more frustrating to be amongst mountains but stuck indoors on a perfect day. Anyway, the bonus was that the course finished earlier than expected. On the way home, I made a diversion down Windermere so that I could get up Gummer How in what remained of the daylight. It was still raining and I wasn’t really suitably dressed or shod, but the cloud had noticeably lifted and beggars can’t be choosers…. I didn’t even get as far as the top – I’d promised to be home to take nipper number 3 for his late afternoon pushchair ride/nap – but I enjoyed being out none the less. I got high enough to have a view of Morecambe Bay, Whitbarrow Scar and across the Kent estuary to Arnside Knot, which from there looks like a small hill nestled in amongst much bigger ones. (Which it sort of is – but the bigger hills are quite distant from it.) On reflection, it’s probably slightly odd that whenever I walk slightly further from home than usual, it always gives me great satisfaction to look back and see Arnside Knot (from the North) or Warton Crag (from the South) – the little hills that bracket home. As I neared the road and the car park I could see that the cloud was continuing to lift – the Langdale Pikes were clear, the Coniston Fells were clearing and Caw just had a final cap of cloud that looked like it might lift at any moment. Out twice today, both for about an hour and both in Eaves wood. 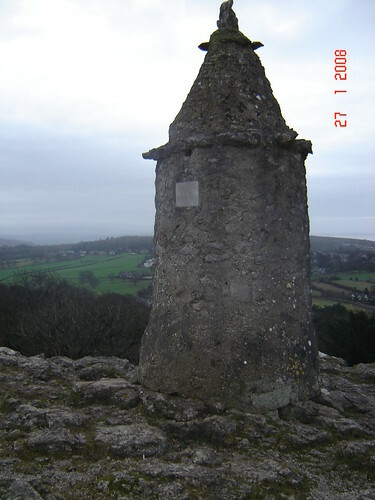 In the first instance, headed up to the Pepperpot. The views weren’t as good as they can be, but it was just nice to be out. Having not seen the Roe deer yesterday, I wanted to maximise my chances today, and there is a clearing in Eaves wood where they can often be seen. Sure enough as I came out of the trees I saw two white rumps bouncing away. At first I lost them, but then I saw that they had stopped away to my left. As I watched them, two more deer emerged from the trees ahead. They ran across to join the others, watched me for a while, and then the four of them turned and trotted away. I’ve often seen Roe deer in pairs or threes, but I don’t think that I’ve often seen four together. Eaves wood is a mixed wood with oak, hazel, birch, yew, scot’s pine etc, but the trees that stood out for me today were the beeches. 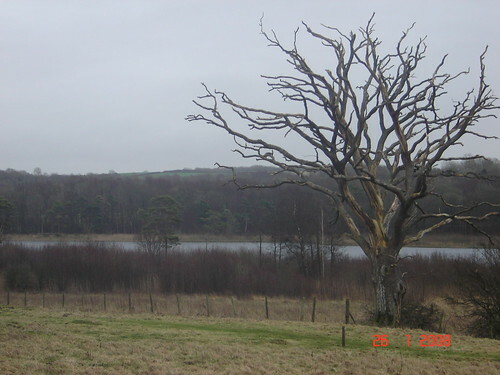 When the trees are all bare, the smooth grey bark of the Beech becomes very prominent. When I first moved to the area, this tree was huge. And unlike most of the beeches in the wood, which are tall and slender, it was broad, with many large wide-spread branches. 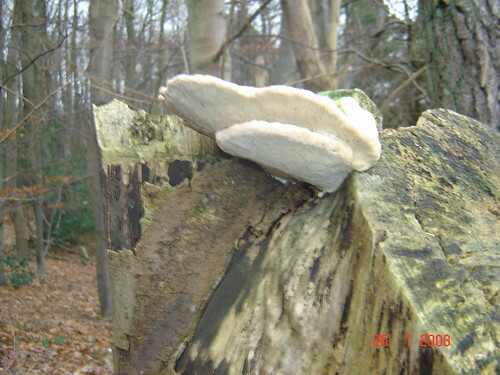 Even then it had a bracket fungus growing on it. 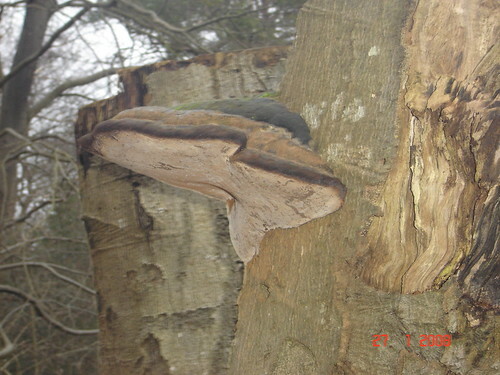 Subsequently, it was felled, but the timber has been left in situ, and it’s all now growing these huge bracket fungus. 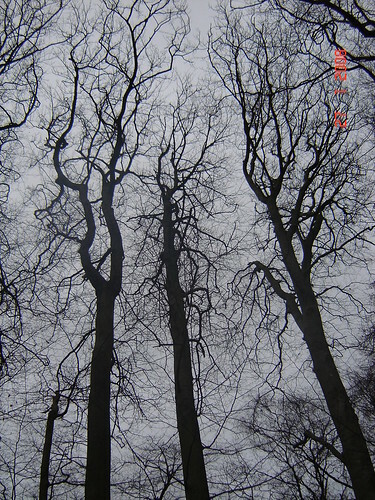 This is part of the Ring o’ Beeches, which is, as it sounds, a perfect ring of mature beech trees. It’s a special spot for me, because I almost proposed to the lady who is now my wife here. I had been waiting for the right moment and this felt sufficiently romantic, but then Angela, who was wearing sandals, noticed that the wood ants were walking across her feet, reacted badly, and the moment was gone. Can you see the wildlife in this photo? Well no. But I can tell you that there are always lots of rabbits in this field. And that both Buzzards and Kestrels frequently hunt here. There were ducks down on Haweswater and just after I took this photo a flock of geese flew overhead. Shortly before I had been watching a heron flying laboriously past. Parts of the field are littered with mole hills. (More of that rich red coloured soil that I’ve mentioned before.) I’ve never yet seen one of the moles, but I’m confident that they are there. In the woodland down by the lake I was crouching to photograph some snowdrops when a dog walker came by. He was right of course. The snowdrops were the reason that I had come this way today. Just as I do at this season every year. Somehow here amongst the leaf litter in a damp woodland on the edge of a small lake the snowdrops are more valuable than the hundreds flowering on the local roadside verges. He told me that his dogs had put up two roe deer. I knew that it was unlikely that I would see them myself. But now I knew that they were there. 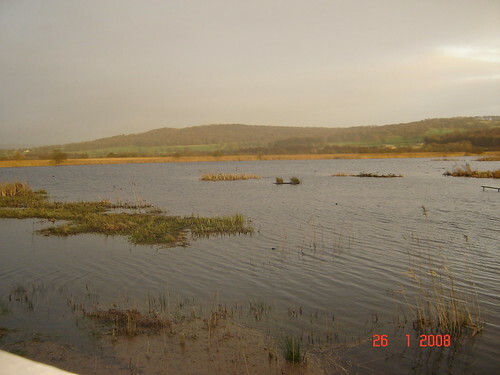 He volunteers at Leighton Moss and described how a forthcoming job is to assess the size of the Water Rail population. Water Rails are very shy birds, so the wardens row around the meres and channels playing a recording of a male water rail’s cry. In the breeding season any nearby males will respond, intending to put off any potential rivals. They rarely see the birds. But they know that they are there. Haweswater is quite a deep lake, sitting on a layer of volcanic ash deposited when the mountains around its Lake District namesake were active volcanoes. 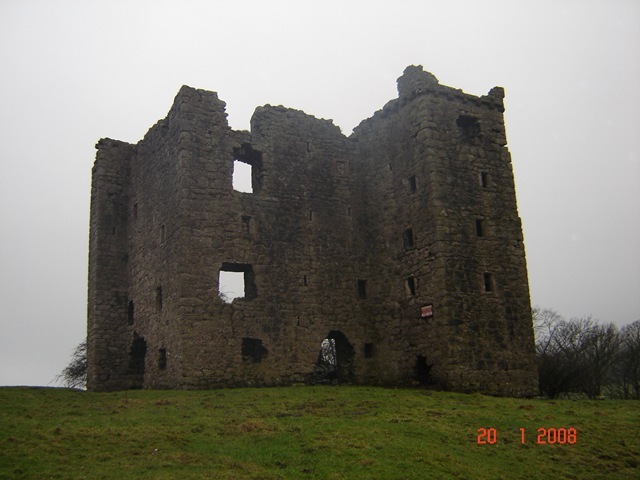 According to local legend it has a Wyrm, though I haven’t seen it. It reputedly has otters, but I’ve never seen them either. On the far side of the lake is a small bridge over an inflowing stream. I have seen otter spraints on the rocks here, and one bank of the stream is always muddy and clear of vegetation. I like to imagine the otters getting in and out of the water here. Today I almost convinced myself that I could identify otter footprints. Last night, half listening to a television documentary whilst washing-up, I heard something that seems quite shocking to me. Apparently there are more tigers in American zoos than there are in the wild in India. We often take our kids to the South Lakeland Wildlife Park. They have a pair of Amir tigers and a pair of Sumatran tigers. My favourite part of our visit is watching the tigers power up tall posts to grab their meat for the day. It’s breathtaking. I don’t suppose that I will ever see a tiger in the wild. But like the moles and the otters that I don’t see on my walks, it’s important to me that they are there. Like the snowdrops, they become more special in their own environment. This afternoon we took the kids to Leighton Moss. Our intention was to see the starling roost. Because most of the paths were underwater we didn’t get right under the flock to where you can hear the screeching and the woosh of thousands of wings. However, we did see it from a distance. It’s breathtaking. And I’m pleased to say that the kids were captivated too. The starlings gather together as the light starts to fade, until a huge flock is wheeling, pulsing, flowing around the sky. It’s amazing how they all seem to turn together. Watching this black cloud of birds moving seemingly with one mind, it’s easy to imagine how you might think that you were witnessing the flight of some supernatural entity. A wrym for instance. 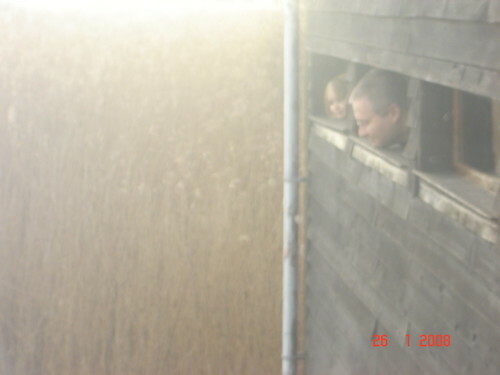 Amy and me misunderstanding the point of a hide. An inspiration for my Blog is Richard Adams’ A Nature Diary. Essentially it does exactly what it says on the cover: it gives a day by day account of the things that he has seen each day in the countryside. But it is also very much rooted in one place – his home on the Isle of Mann. He takes his dog Tetter for walks along his local lanes, over the hills and glens, on cliff-top paths and beaches. We also get to hear about meetings and visits with friends, trips to Australia, Denmark, Anglesea, London and fell-walking in the Lakes. And Adams’ idiosyncratic views on any number of issues. So quite like a Blog really. At least half of the charm is in the wonderful illustrations by John Lawrence. 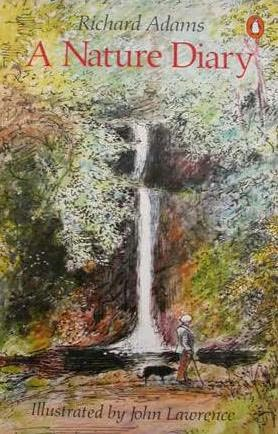 In my hardback copy there are water colours on every page, with half of the pages in colour. They give a real character to the book. Had to get a train ticket for a meeting in Birmingham next week. And since it was a fine, sunny, blue-skied day (if a little blustery), I decided to take a scenic, circuitous route back to work (I had some free time). The view from the top of the hill by the Castle and the Priory Church wasn’t quite as good as I’d hoped, but I could see Gummer How and Hampsfell even if the larger Lakeland fells weren’t visible. Crossing the Millennium foot bridge I noticed that there were quite sizeable swells coming down the Lune, which I don’t think that I’ve seen before. The river was high but clearly not as high as it has been and walking along the cycletrack there was quite a stench from the area that had been flooded. Amongst the expected flotsam of plastic bottles and the like was an armchair. From Carlisle bridge the view along the Lune to the Ashton Memorial and the Butterfly House in Williamson Park, with Clougha Pike behind was excellent. Sadly looking the other way along the river you see a landfill site and Heysham Nuclear Power Station. It did occur to me that this title for a Blog might create an anticipation of some kind of Sado-Masochist content, but I suppose that anybody looking for that will be disappointed (unless they count walking in the rain). The point is that, by necessity, my walks are likely to be short and local, mainly starting from my own front door. I was thinking of the idea of the familiar and intimate: places visited frequently, at particular times of day or seasons of the year. And with the spring fully settled, I feel the need to see the summer birds ‘in their places’. I suppose it is a kind of beating of the bounds , not just the parish itself, but of my internal map of haunts and memories, a way of confirming the continuity in my own life as much as in the landscape. I don’t keep a mileage log (although…..why not, what an appealing idea), but if I did a 5 mile qualifying minimum would make the whole idea redundant anyway. An unexpected bonus tonight of not only a walk, but a little bit of daylight for the walk too. I was out yesterday evening for a half an hour jaunt in the rain and the dark with nipper number three having a nap in the pushchair. I was drenched by the end, but bizarrely I enjoyed it. The river here is the Kent, rising on the slopes of High Street, flowing through Kentmere and Kendal and out into Morecambe Bay. Not so long ago there was an extensive grassy foreshore, but the Kent channel moves across the estuary on a cycle and at the moment it is right over on this side. As the foreshore eroded away it revealed a series of very tall posts – you can just about make one out in the right hand picture. It also uncovered a Victorian tip with lots of shards of pottery and bits of old bottles. There was some colour to see because the cliff-top path here has a rich ruddy mud. 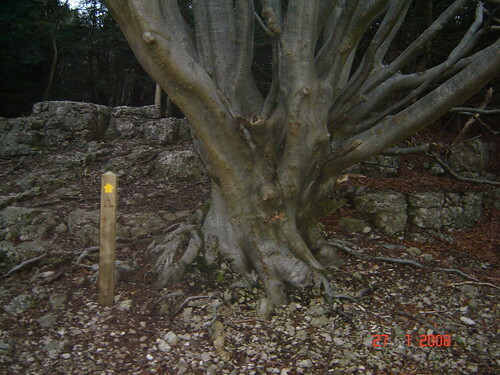 In fact, there is a a sort of gully cut back into the cliff where the limestone is very red. This is apparently a Heamatite mine (an iron ore used as a dye I think) dating back to Roman times. Later, walking through the village up Stankelt Road, I heard an owl calling, seemingly quite close by. The calls got louder and then there it was ghosting along the treetops in Clark’s Lot. By the time I got home it was dark and Sam had woken from his nap.